Southwest Florida International Airport serves key tourist destinations in the US State of Florida, including Fort Myers, Punta Gorda and Sanibel Island. 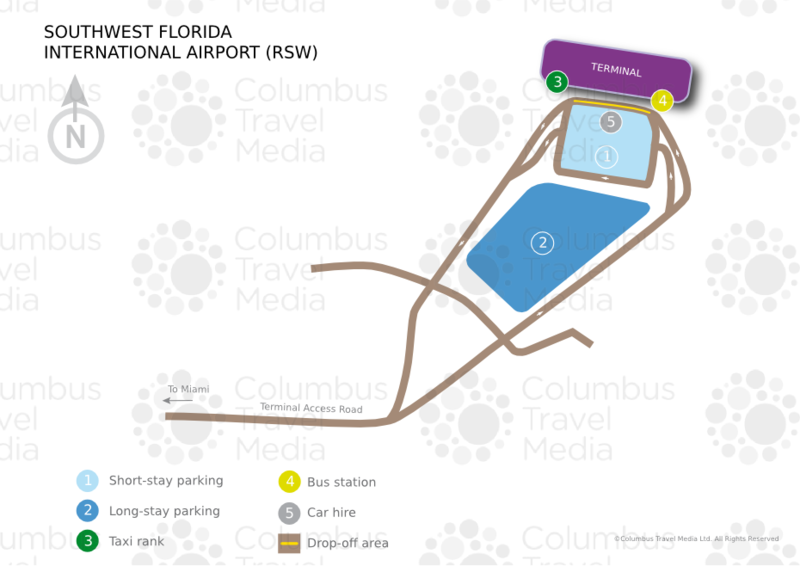 A useful resource for travellers, our Southwest Florida International Airport guide contains a wealth of information about the facility, including details of terminal services, public transport access and recommended nearby accommodation options. Airport information desks and tourist information desks (operated by Lee County Visitor & Convention Bureau) can be found on both levels of the terminal. The airport can be reached directly from Interstate 75, which runs past the eastern edge of Fort Myers. To reach the airport from central Fort Myers, head east on Dr Martin Luther King Jr Boulevard (FL-82 E) and join Interstate 75 heading southbound. From here, take the dedicated exit 128 onto Terminal Access Road and follow the signs to the airport. The total drive time from Fort Myers to the airport is approximately 20 minutes. Southwest Florida International Airport is situated 16km (10 miles) southeast of Fort Myers. Bus:Lee Tran (tel: +1 239 533 8726; www.rideleetran.com) provides public buses from 0725 to 2125 (2005 on Saturdays and 1856 on Sundays), though this changes seasonally; check the airport website for the most up to date bus schedule. Bus 50 connects to central Fort Myers (journey time: 40 minutes; fare: US$1.50), calling at Daniels Parkway, where connections can be made to other routes. Shuttle:Many hotels in the area offer a shuttle bus service to/from Southwest Florida International Airport. Other shuttle providers are available – information on these can be found at the ground transportation booth, which is situated between the terminal and the short-term car park. Taxi:Fixed-rate taxis are available from Southwest Florida International Airport and can be booked in advance or upon arrival at the ground transportation booth. Companies include MBA Airport Transportation (tel: +1 239 482 2777; www.mbaairport.com). Fares range from US$20 to US$40, depending on the taxi company and destination. Currency exchange services are available from Travelex and the business centre on level 2 of the main terminal area. ATMs can be found throughout the main terminal and its concourses. There are more than 30 places to eat or drink within the terminal. Options include fast-food outlets, cafés, bars and restaurants. There is a selection of shops selling gifts, regional specialities, travel accessories and golf equipment. Newspaper vending machines are available at various points within the terminal. Enquiries for items lost within the terminal should be directed to Lee County Port Authority (tel: +1 239 590 4810). For items lost in the security screening area, contact TSA (tel: +1 239 210 6419). Luggage storage is currently not available at the airport. There are animal relief areas at both ends of the terminal for those travelling with dogs. A business centre (tel: +1 239 561 2204) with fax and photocopying facilities, laptop connections, internet kiosks, money exchange and a courier service is available on the second level of the terminal. For further meeting/business facilities, the nearby Holiday Inn Myers Airport (tel: +1 239 561 1550; www.ihg.com) houses a range of meeting rooms with capacity for up to 350 delegates; these can be rented by non-guests. Free Wi-Fi internet access is available throughout Southwest Florida International Airport, and static internet kiosk can be found in the business centre. There is also a postal service at the airport and pay phones are available in the terminal building. There are TDD telephones in the terminal for hearing-impaired passengers. Wheelchairs can be provided on request, and there are lifts and ramps where necessary. Passengers requiring special assistance are advised to contact their airline prior to travel. There is parking space for more than 11,000 vehicles at Southwest Florida International Airport. Short-term parking is available in a multistorey car park directly across from the terminal. Long-term parking is located beyond the short-term parking garage – shuttles provide transportation to the long-term car park. In addition, there is a 'cell phone lot' for drivers awaiting arriving passengers, which can be accessed following signs along Terminal Access Road. For further parking information, contact Standard Parking (tel: +1 239 768 6296). Car hire companies located at Southwest Florida International Airport include: Alamo, Avis, Budget, Dollar, Enterprise, Hertz, National and Thrifty. Arriving passengers should proceed downstairs, exit baggage claim and walk across the street to the Rental Car Service Centre, which is located on the ground floor of the multistorey car park.